Ulster number eight Nick Williams will join Cardiff Blues on a long-term contract before the start of the 2016-17 season. 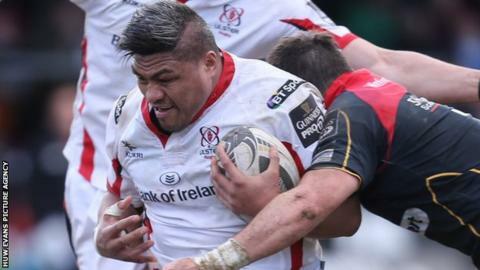 Williams, 32, has scored 13 tries in 67 appearances during four years with Ulster. The New Zealander has also played for Auckland Blues, Munster and Aironi. "I'm excited about what Cardiff Blues are looking to achieve, both on and off the field in the coming years," Williams said. Cardiff Blues head coach Danny Wilson said Williams has been one of the "standout performers" in the Pro12 during the last few seasons. "I spoke to Danny at length about the region and his plans," added Williams. "I'm now looking forward to using my experience to help the team and getting stuck in. "I've enjoyed my time in Belfast and it's been a successful time at Ulster - I'll be giving everything until the end of this season for the team." Williams, older brother of Chiefs wing Tim Nanai-Williams and cousin of All Black Sonny Bill Williams, made 37 appearances for Auckland Blues in Super Rugby. Having also represented North Harbour, Williams joined Munster in 2008 and helped them secure the Celtic League title in his debut season. He later moved to Italian outfit Aironi, where he scored 10 tries in 31 league games, before linking up with Ulster in 2012. Auckland-born Williams was a fans' favourite at Ravenhill and was named the Pro12 player of the 2012-13 season. Wilson said: "He is an extremely physical and uncompromising forward who will give us real edge and bring a real winning mentality with him. "Nick is undoubtedly a strong ball carrier who is involved in big collisions in both attack and defence." Last season, Williams was given an eight-week ban for striking Rhys Patchell during Ulster's home win over the Blues. Patchell will join Welsh rivals Scarlets at the end of the season.